Well, here we at the final day of my Twelve Days of Christmas challenge - it's hard to believe that there are only a few days more sleeps to Christmas. As this is the last card I'll be sharing with you using Magenta's My Christmas Tree / Mon Arbre, Ive made one with real impact - an explosion of colour - like all the twinkling lights festooning the houses in my neighbourhood. This technique is called Faux Carnival Glass and its bejewelled appearance belies its simplicity. 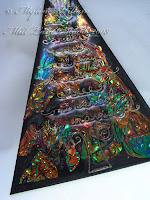 I began with a piece of black coreboard the shape of the tree which I coated with Versamark Watermark inkpad and a layer of Franklin Opals embossing powder. In this technique you keep adding layers of powder and heating in between until you have a smooth surface and then you add pieces of Fantasy Film into the molten Opals. I like to give it another burst of the heat gun at this point so that the Fantasy Film warps a little and intensifies in colour. Then add another coat of ink and more Franklin Opals to make sure the Fantasy Film is covered before stamping the inked tree into the surface. What an impressive tree! This turned out to be another one of those tricky cards to photograph with reflections from the glossy Franklin Opals making it difficult to see the tree stamped on the Opals so here's a photo of the tree before the card was assembled. 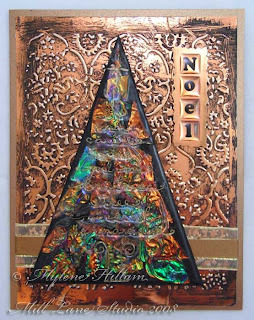 The background of the card is copper mirror board embossed with the Cuttlebug. Mirror board is so shiny that it sometimes needs toning down and I did that by painting the whole surface with black acrylic paint and then wiping most of it away with a tissue before it dried. Too easy - looks like antiqued copper! The letters are epoxy alphabet stickers attached to a deckle-edged strip of mirror board. Sitting on top of the embossed background, it looks like a piece of copper sheeting. The finishing touch is a couple of lengths of ribbon layered underneath the tree to help anchor it to the card. Thank you to all of you who have followed me during this challenge. For those who have left comments and those who have emailed me privately, it has been lovely to have you along for the ride. I hope you've enjoyed my daily offerings - it has been fun (and challenging!) to make 12 different cards with the one stamp. Each one is so different and now I can't decide which is my favourite so I'll have to leave that for you to decide. Don't forget that today's post is the last one to leave your comment on to register for the blog candy draw. I'll be taking a couple of days break from blogging and then I'll be back before Christmas to announce the winner. Until then..... good luck, and Merry Christmas to you all. Oh my goodness this is simply the best card I have come across this year. I am so glad you explained "how to". 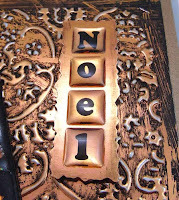 The copper embossed background looks stunning and I would never have guessed just by looking at the photo just how easy. Thank you for sharing the 12 days with us, I don't think I have commented till now, but this time I simply had to say something. Have a wonderful Christmas and a creative New Year. Pretty Special Mylene!! It's taken me a couple of re-reads for today's & yesterday's cards to absorb how you have achieved these cards. Both are beautiful. I'm looking forward to having some time to 'play' in the next week or so and having a go at some of this. I particularly like what you have done with the embossing of the copper mirror board, plus the acrylic paint to tone it down!! I've enjoyed reading your challenge - thanks for sharing. Wow, this is gorgeous! A couple of questions please.....I don't have any Opals or Fantasy film.....are the pretty opal-like blobs of colour the film or the EP? Such a lovely contrast between the tree colours & the copper BG; beautiful work! Thank you for all of these Mylene, you have really set a standard for the one-stamp type of challenge. will you leave these pieces of art on your blog for awhile? I want to let the craziness (& tidiness) of Christmas pass so then I have time again & no visitors, so I can mess the place up with my creativeness, LOL! The colour is from the Fantasy Film but it looks like faux opal. Now, just to confuse things, the Opals I refer to are a thick embossing powder - the one I used is called Franklin and it's clear. When you melt it with a heatgun it becomes clear like glass so that you can see right through to the beautiful iridescent colours of the Fantasy Film. I'll leave the posts up on my blog so you'll be able to come back and refer to them when you need to. Thanks for a very inspirational 12 days Mylene. I love today's card, but I have to say the acetate one is my favourite. Merry Christmas and all the best for the New Year. Hi Mylene, when you said you would use the same stamp for 12 cards, I didnt think it was possible, but, you did it and they have all been great, it was a super idea, hope you do it again next year. Thanks for your answers Mylene! Looks like I have some more products to put on my wish list....and DH thought he'd cleared it off, LOL! Mylene, you are very talented lady and I have really enjoyed watching your progress through the 12 days of Christmas. All of the cards are beautiful and it is very hard to pick which one is the best!! Hope you and your family have a very Merry Christmas. Beutiful works, I have never seen the fantasy film, will have to starte looking in Denmark! And the "opals" are just wonderful! Absolutely beautiful and inspiring cards, as always. I didn't realise how close Christmas is until now... less than 2 months away! Such a scary thought!